Interesting idea: some of these are MUCH more sensitive. I had a thought, put some in a pressurized helium atmosphere for months at 70 Celsius to see if this helps. Also for tubes where they are damaged in some way ie low threshold voltage: He should increase the mean free path length and thus affect the count rate, provided it does not get hot enough to deform or melt the sealing pip which on some tubes is a low melting point alloy of composition BixInySnz or sometimes a Cd variant. Source: the same effect is seen in PMTs. Also relevant: my idea inspired by dark matter experiments. Put a few of these tubes that have failed testing ie messed up threshold in a helium atmosphere to repair them AND increase sensitivity. Only works if they are just low threshold so the gas fill has the wrong pressure inside. Hi, just a thought but some tubes seems to have a bad connection to the – side. I found that “dead” or noisy tubes can have this symptom, the giveaway is that both end caps will be isolated from the metal case and it should read less than 10 ohms from metal case to – cap. Also worth mentioning that the glass to metal seal on the + side (other end) is VERY sensitive indeed and can be damaged easily. Hint: its somewhat transparent and you can usually see a continuous faint blue (rather than red flashes- normal discharge as seen on end window tubes) glow inside tube if its leaking. Might actually try and make a hybrid indicator to pick up weak discharges and do a double count indication with something like an avalanche photodiode (aka APD) with parallel 160V zener running from the existing HV supply so I can run it from 550V supplies such as the ones on cheap dosimeters. I had no idea that you could actually SEE the discharges. I’ll have to check this out. Thank you for the tip! I got from my supplier a badly dented STS-6 GM tube. As I am curious, I opened it up and found that there is no gas containing ampoule inside. Thus the sealing is demanded to a perfect tube-caps crimping. I have more tube of the same type. Some of them have caps loose, therefore I suspect that the inside gas has leaked out. However those tubes work normally. Antonio – are you sure that there are no glass to metal seals under the end caps? if you tell me how to post a picture, I’ll show you that there is nothing else inside the STS-6 tube. By analogy, there must be no gas gas containing bulb also inside the SBM-19 tube, as the weight of the two devices is exactly the same: 17.2 grams. 0.61 ounce. The two tubes have the same dimensions. The glass seals should be under the end caps only. There is no glass in the rest of the tube. There is no sealed gas bulb inside the tube. Therefore the sole sealing is the tube well crimped to the end caps. But if crimping is faulty, the caps are loose and the inside gas leaks out. This is what happened to some of my tubes. However the tubes with loose caps still are working. I wonder how is that possible? Post photos on the forum and I’ll take a look. 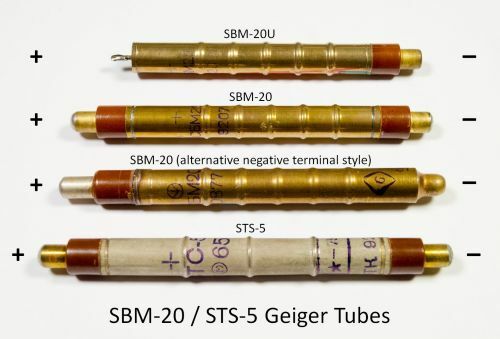 Does the cover of the SBM-20 Tube, the brass colored metal conduct electricity, or should I cover it with thin layer of rubber to be safe to touch or use it on a stick? And how much would a thin layer of rubber block Beta radiation? Repeat of the question with email request. I haven’t built a detector specifically for xrays, but the sbm-20 tube is somewhat sensitive to xrays based on what I have heard from others who have experimented with them. A tube with an alpha window might be more sensitive. Difference between СБМ-20 & СБМ-20У is in climatic standards. 20У is for moist climate. Both for mild and cold zones (-60,+40) Since Soviet Union was vast, there were many different regions from far north to east. Requirements is in ГОСТ 15150-69. Also you should not solder those terminals, there are connectors for them, like for tube fuses. Senz – Very interesting. I had not seen the environmental ratings before. Thank you very much for this information! if I measure CPM, which one should I use for public? A Geiger tube just tells you an X-ray or gamma ray has been detected. It does not tell you the energy of the radiation, which is what determines the type and depth of damage done to your body. Really, all a Geiger counter will do is tell you if there is radiation in the area and the relative amount. To get true dose information, you need more sophisticated equipment that measures the energy as well. In general don’t attempt to use the Geiger counter for dose measurement.